Preview button added - renders only current frame without saving anything - no images, no vray maps, no scripts running, no elements. Ortho mode added to Vray rollout - it turns any camera to orthographic, including Vray Physical camera. Copy/Paste from one camera to one/several cameras - use new buttons at the top of the window. Submit Scripts section - you can assign script files that will run on each render submit. Per Submit script runs once per render submit and Per Camera script runs for each camera before submit. All these scripts run on local machine, not on render server. Last Rendered Location field - here is stored last render file location. Very useful for locating last-time rendered images. Run this script with Maxscript -> Run Script command from any folder on your hard drive, then go to the *'Customize User Interface' -> 'Toolbars'*, browse to category 'Sergo Pogosyan' and add 'Render scene cameras...' button to the toolbar or to the menu. When you start this script it iterate over all cameras in scene and list them in the dialog box. To each of these cameras you can assign frame resolution, number of frames to render including nonsequential frames, output file location and lighting setup. All these properties can be changed for one or several selected cameras. Output file location is split to folder path and file name, so you can specify new folder for all selected cameras in scene. 'Lighting assignement' section contains three list: Solo light list contains lights that will be only lights turned on during the rendering, 'Forced On' and 'Forced Off' lights are turned on or off respectively during the rendering. 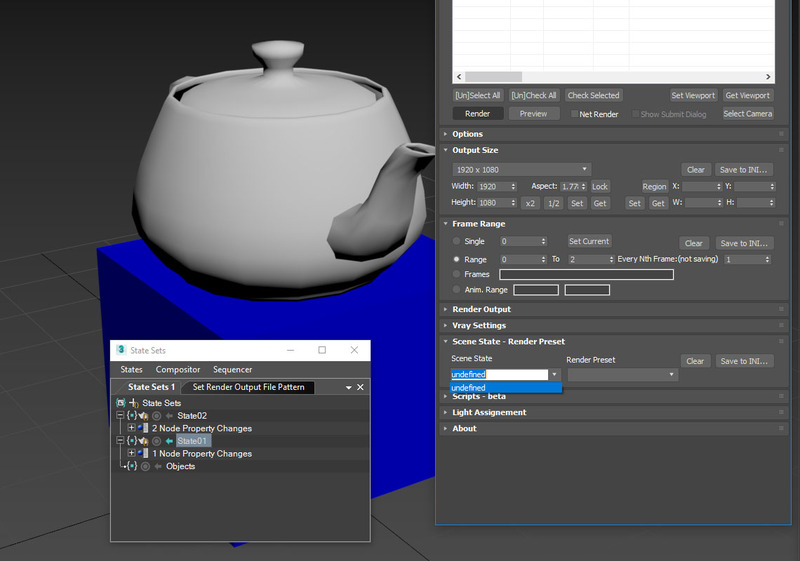 After all these setting will be set up (if some properties is not set value from the Render Setup will be used), check the camera(s) in the list and hit Render button. Check Net Render checkbox to submit network render job. Submitted by pixelab on Sat, 2016-12-10 10:29. Also, the "custom keyword and name" is a bit confusing, is there where you put backbuner job name ? syntax is like file names ? %cmameraname% will work ? To get the alpha with the render, should I use max render elements, or will it work with VRAy ? Submitted by mali on Mon, 2016-11-28 07:24. Oh man, I feel silly now. I never thought of doing it like that :D Thanks a lot for the tip! Submitted by sergo on Sun, 2016-11-27 16:28. @Angrymodeler, @koltscho - I need some time to learn how to use state sets. If they work in the way old-style scene states work then it will be possible to add them. @mali - 1) If I understand correctly you can just select all the presets and change the path for all of them. 2) FOV parameter adding is possible, but requires some time. Let's see if any more people request it. Submitted by Gracepoint on Wed, 2016-11-23 13:05. Waiting for 3Ds max 2017 version. Submitted by mali on Wed, 2016-11-23 08:03. 2) Would it be possible to add vray camera type and FOV override (found in the render settings) per camera? For example, I have 15 regular views and 1 panorama view which I set to spherical type with 360 FOV. Submitted by koltscho on Wed, 2016-11-23 06:23.
great script. But I have a problem. I am using max 2017 and I can't set my scene states. When I click the scene state rollout I don't see any states (doesn't work in max 2017 batch render either). I know your version requirement says: 3ds max 2008-2016. 32-bit and 64-bit. But can you tell if there is going to be a version for max 2017? Submitted by sergo on Wed, 2016-11-02 21:53. I would suggest trying Custom Keywords section in Options rollout. This is exactly what they have been done for. You simply put name of the keyword and next to it a maxscript string, to "calculate" value of the keyword. Then you use your keyword as standard keywords. I'll post working example shortly if you can't figure it out. Submitted by arcadio on Mon, 2016-10-31 03:51. First I want to thank you for perfect script. I appreciate your time spend with development. Second I have an idea that with "keywords" in your script (for example %scenestate%) you can also use a vray "keywords"
it would be very useful, but I dont know if you have access to this variables, or if it isnt too time consuming to add that. Thanks again for prefect script. Submitted by e_samurai on Sun, 2016-10-23 05:58. Is the crash happening with an unhandled exception? Are you using scene states or render presets? I got the same issue and fixed it by correcting whatever goes wrong when the second camera loads (another render preset). Check out my comment above. Hopefully will help you! Submitted by e_samurai on Sat, 2016-10-22 15:57. The try catch thing is because these changes will not be applied unless the dialog is closed. 2- For an extremely weird reason, when working with Vray Sky and a manual sun node, if you save this in a Render Preset or a Scene State the sun node will magically disappear from the sky map when the script loads the sequence (or even whenever the render preset is changed). I simply wrote a code to recreate the map or repair the node where possible. Before doing that, the script caused "Unhandled Exception" with Vray when I simply kept re-assigning the same map to the environment map. P.S: The IR and LC modes don't work properly in most cases (PrePass - Rendering) for animation. Other than that, it's GREAT! Sometimes things do disappear (checkboxes or paths) but the most incredibly useful feature is the %name% tags that saved my life today! Thanks again and keep up the great work!